We’ve known Marybeth Hall and her husband Glenn for quite some time. In Lower Russian River time, they are pretty new neighbors and owners of the property directly below Sonoma Orchid Inn. They also own the property across the street. You know the one, it used to have llamas and sheep. Well, now it is an animal sanctuary called When Pigs Fly Ranch. The Market team got to sit down with Marybeth to hear more about the sanctuary she loves, the damage she incurred from the high waters, and her plans to rebuild. Marybeth and Glenn are hosting an event to raise money to help with some of the costs. The event will take place on April 16, 2019 6:00 pm at the Rainbow Cattle Company’s Give Back Tuesday. Read on and if you want to donate money or in-kind auction items for the event feel free to reach out and we will put you in touch with Marybeth. What is when Pigs Fly Ranch? When Pigs Fly Ranch is a micro sanctuary on the Russian River just outside of Guerneville, CA. Our mission is to let farm animals who would otherwise have no home live out their lives in safety, peace and harmony. We currently have five pigs and 14 chickens. What go you inte rested in building the Ranch and where does your love of pigs come from? I’ve been an animal lover and advocate since I was a child, and have been involved in animal welfare for the past 30 years as a volunteer and financial donor to many organizations. 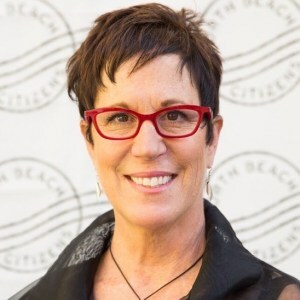 I also served on the board of directors for Muttville Senior Dog Rescue in San Francisco, so I was able to gain experience on how a rescue group was run. It’s been a dream of mine to have an animal rescue or sanctuary, and when we moved to Guerneville my dream became possible, because we were able to buy a home with some land. As for pigs, that happened by accident! Our neighbor kept a wild sow on the property next to ours, and I met her on Thanksgiving day, 2016, while taking a walk. I fell instantly in love with this large, sweet, smart and gentle creature, and although all of our interactions were through a fence, I could see how much she craved attention. My husband and I asked her owner if we could move her to our property, and When Pigs Fly Ranch was born! We built a shed and had secure fencing installed, and she moved to her new home in March of 2017. Once word got out that we had room for more, people reached out to have us help with pigs they could no longer keep. Can you detail what a happened to your property during the flood? On February 25, it was reported that the river would reach 38′, so we figured we’d be okay because that’s the level it reached in 2017 and the sanctuary land didn’t flood. Then, at 10:00 am the morning of February 26, our neighbors came over to tell us they heard the river would reach 48′, and we knew we were in trouble. Our biggest concern was evacuating the animals, and with 5 pigs we knew we’d need help. We called in volunteers from Sonoma CART, a new organization we’re involved with whose mission is to aid in animal evacuations during emergencies. 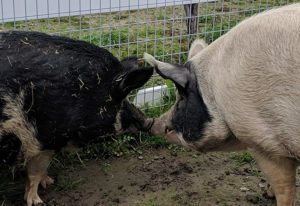 We were able to move two of the five pigs during the afternoon, and one of the pot belly pigs we moved to our backyard because she has a medical condition that requires daily care. The other two pigs would not get on the trailer, and we ran out of daylight. We decided to keep them overnight, and since we heard the river wouldn’t crest until midnight the next day we thought we’d have time to move them. Nature wasn’t on our side, however. When we woke up at first light on February 27th, the sanctuary was already a foot underwater. The river had reached about 40′ at this point and was rushing through our property. The two pigs we couldn’t move the day before were okay, but we knew we had to get them to higher ground. In the meantime we had to evacuate the 14 chickens that were inside their shed – the water was already at floor level. By the time we got all 14 out, the shed was flooded. 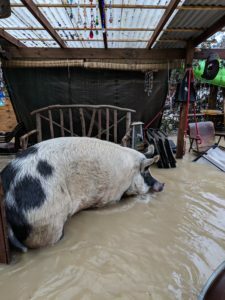 The pigs, who really don’t mind water, were stubborn about leaving their home, but finally, after about two hours of persuasion, they walked out of the sanctuary gates onto Odd Fellows Park Road, where we were able to get them to higher ground and safely out of the flood waters. By that time the river was surging through at about three feet. By the time the river crested we had over 4′ of water roaring through. We ended up having to keep the pigs on the road for two nights. We were totally land-locked with River Road being flooded on either side of us, so no one could get in to help us move the two remaining pigs. We ended up sleeping in our camper, parked as a barricade to keep the pigs off of River Road, for two nights while the pigs stayed outside in a tent! 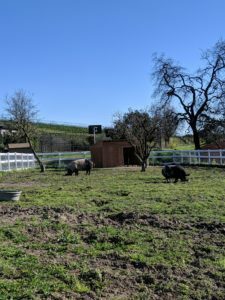 Finally, on March 1st help came, and we were able toget the two pigs loaded onto a trailer and moved to Charlie’s Acres, a sanctuary in Sonoma. Where did you evacuate the animals to? Four pigs went to Charlie’s Acres farm animal sanctuary in Sonoma. We are SO thankful to them. 14 chickens went to our neighbor’s coops at Sonoma Orchid Inn. One pot belly pig is living in our back yard, and the cat is now a house cat :). What damages did you have? We suffered damage to the sheds, fencing, and gates. Because we focused all our energy and time trying to evacuate all the animals, we didn’t have time to remove or protect our tools, equipment, furniture, and supplies used to run the sanctuary. The sheds that house the animals were all damaged. Fencing was either damaged or torn down by the force of the river. Most of our power tools were destroyed or damaged. Stone was washed away. What will it take to rebuild? All the sheds have to be repaired and the roofs need to be replaced. Fencing needs to be reconstructed in some areas and repaired in others. New gates have to be made in a couple of places. We’ll need to replace stone that was washed away and add new stone in several areas that suffered from erosion. When is your event to raise money? April 16, 2019 6:00 pm at the Rainbow Cattle Company’s Give Back Tuesday. What are the pigs names? What else do you want to tell the world? While the flood was a devastating experience, we’re thankful that all the animals got out safely and are doing well in their temporary homes. While we were camped out on the road with the two pigs we couldn’t move and had an outpouring of support from our neighbors and friends! We so appreciate everyone who came to our aid physically, emotionally, financially and spiritually. © 2019 [big bottom market]. All rights reserved. All prices are in USD. eCommerce powered by Etsy.